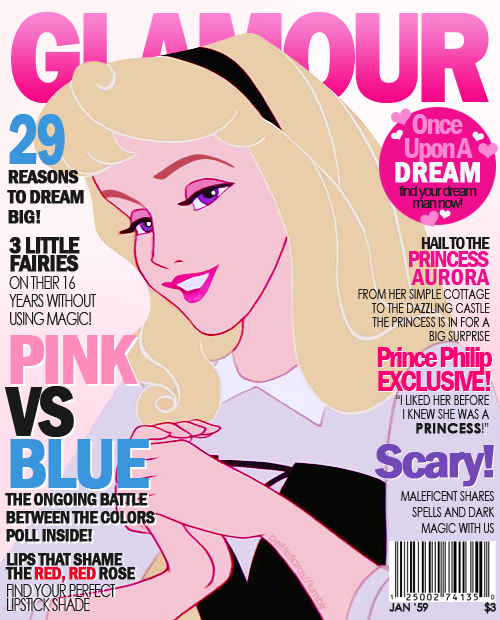 Continuing this series of posts (part one if you missed it), where we look at a series of faux magazine covers created by the Petite Tiaras tumblelog that feature the various Disney Princesses. …a magazine that translates style and trends for the real lives of American women. Our award-winning editorial covers the most pressing interests of our 12.4 million readers: from beauty, fashion and health to politics, Hollywood and relationships. We’re often optimistic, always inclusive, beyond empowering and can always separate the Dos from the Don’ts. Our readers live for fashion, live for beauty and most of all, live for Glamour. For the most part, it is a good match. Aurora’s story is compelling, and the tale and all that surrounds would certainly be useful in a magazine like Glamour. There’s a good dose of style content and there are personal articles in there too. Living up to the billing are the articles that provide advice to the reader. …reports on the latest in fashion, beauty, health and entertainment, as well as information and advice on the complex real-life issues that young women face every day. So “young women” in this case presumably means “teenagers”. 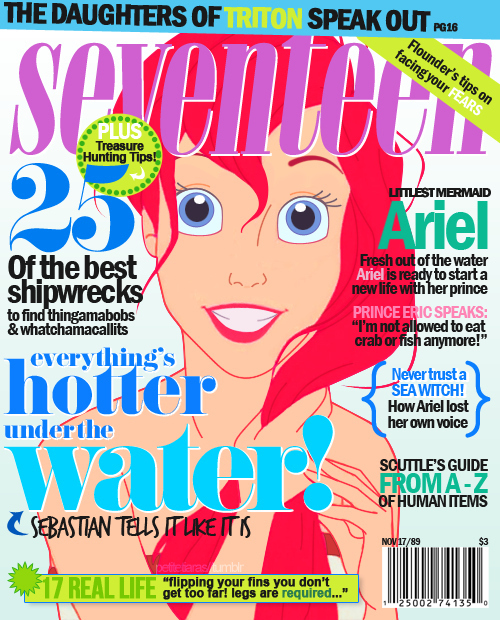 Arial is perhaps the most well known of the Disney princesses for being a rebellious teenager so naturally Seventeen would be the perfect fit. Is this the case? Yes, it is. The cover is filled with a good mix of kiss-and-tell stories, “best of” lists, advice and tips and tricks on how to do things. …conceived as a Jalou family idea that a totally young magazine, for the young and by the young, was essential to complete L’officiel, has been the magazine for the trendy in crowd in Paris for its daring and contemporary editorial positions since 1998. Devoted to women from 18 to 30, looking for an avant-garde view that shakes up preconceived ideas, Jalouse constantly innovates. So it’s an über trendy fashion magazine for any girl who dreams of living in Paris and is looking for a sophisticated alternative view from established publications. 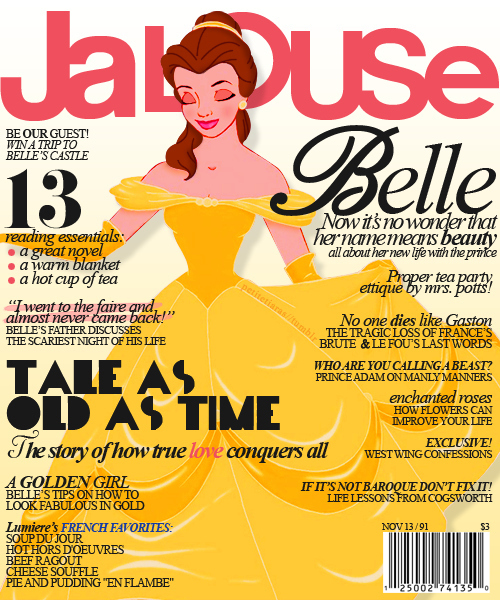 Naturally, Belle is French, so that part makes perfect sense. The rest of the cover seems to live up to the concept. There are plenty of fairly mundane articles that undoubtedly have a special twist and are likely to be more comprehensive in nature than some of the other publications featured here.